Escape the every day at Highgate at The Mile, the newest apartment community in Tysons. Urban connections nestled in a soothing, green setting. 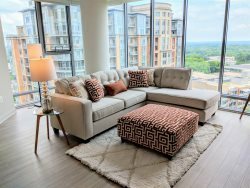 Inside and out, Highgate features a grand collection of features and amenities - timeless design details accented by naturally-inspired finishes to create a comfortable, sophisticated retreat from the bustle of Tysons. Sacrifice nothing at Highgate, where style is of the essence.